Under the sea, fish do what fish do: Seahorse hides, Pufferfish puffs up, Pa Under the sea, a crab follows its heart and its calling, bringing everyone together in the wake of a disaster. Feed your craving for a hilarious, heart-warming story with Crab Cake, perfect for budding environmentalists, kids learning to cope with mishaps, and every young reader in between. To ask other readers questions about Crab Cake, please sign up. These days it’s not uncommon to walk into the children’s room of a bookstore or library and find yourself surrounded by a plethora of picture books that tackle trauma. Once the purview of specialty presses, it’s a little sad to say, but the state of the world and news cycle in the early 21st century has necessitated more authors and publishers to step up to the plate and hand out comfort in 32 page increments. There is nothing wrong with such books in principle, but for a librarian that’s always These days it’s not uncommon to walk into the children’s room of a bookstore or library and find yourself surrounded by a plethora of picture books that tackle trauma. Once the purview of specialty presses, it’s a little sad to say, but the state of the world and news cycle in the early 21st century has necessitated more authors and publishers to step up to the plate and hand out comfort in 32 page increments. There is nothing wrong with such books in principle, but for a librarian that’s always looking for the “rarest kind of best” in their picture books, such message-driven texts can be dull. Inevitably they forgo whimsy in the face of reality. If there is a metaphor involved, the book (which is probably a European import) runs the risk of being too oblique. What I wouldn’t give for a book that tackles the notion of how you can live through something terrible with calm fortitude and a keen sense of when, and when not, to inject some humor. 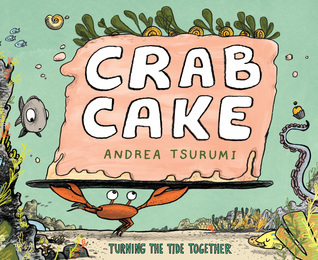 In Crab Cake by Andrea Tsurumi, the book effectively establishes normality, disrupts it with horror, and then assures the reader that normality can return. Heavy stuff for a story about a little crab that bakes. Below the sea the creatures of the deep live their daily lives. They might be sea turtles or tangs or scallops, but all of them have their parts to play. Crab? Crab bakes cakes. Large, strange, underwater sea cakes with frosting and algae and oyster shells. Back and forth we see the fish and lobsters and sharks and eels flittering about, while at the same time Crab bakes cakes. Then one night a boat, laden with human garbage, mistakenly dumps its cargo into the deep. Frozen with horror, no one knows what to do. That is, until Crab bakes a cake. Encouraged by this small act, everybody comes together to eat and talk and formulate a plan. And when that plan comes into play, the solution is sweet and neat. Everything goes back to normal, and Crab? Crab bakes cakes. It’s interesting to compare this book to Tsurumi’s previous book, Accident. That story was this rolling series of chaotic events that snowball bigger and bigger and bigger with every page until culminating into true pandemonium. The tone of Crab Cake is entirely different. First of all, the book is designed to fool the average reader. I know that you’ve probably encountered picture books with a fictional premise, filled with facts in the sidebars. At first that appears to be Crab Cake’s general look, though it is punctuated repeatedly with the inherently ridiculous notion of a crab baking underwater. Amusingly, it's dealing with the same logistical problems behind this that you might find in an episode of Spongebob Squarepants. And while there is a lot of undersea action going on in these pages, you don’t really think it’s much like Accident until the moment that garbage barge dumps its cargo into the sea in a storm. The grey/green image of the garbage flying has a distinct Accident feel to it, but what follows couldn’t be more different. There’s just this two-page silent spread of the junk in an underwater pile. No life nearby. Then, in subsequent pages, silent, horrified sea creatures. No words. Just staring against a backdrop of colors, sickly and bland. If Accident was about taking responsibility for your mistakes, Crab Cake is about taking care of yourself when the mistake is not your own. Let’s go back to thinking about those picture books that show kids how to feel in the face of world disasters. Whenever something particularly awful appears in the news, you’ll hear people quoting Mr. Rogers. I think the line goes, “When I was a boy and I would see scary things in the news, my mother would say to me, ‘Look for the helpers. You will always find people who are helping’.” There’s comfort in knowing that other people are going to be there to help when things get bad. But what Crab Cake does is a little different. First, it maps out the steps of a tragedy. There’s the initial shock and subsequent fear. Then comes the desire to do something. Crab’s contribution is to produce the food that brings the undersea community back together. Eating together suggests normalcy. Once you have that in place you can start to make plans on how to solve your problem (in this case, an underwater trash mountain). Here the creatures use their own special skills to work together (I was particularly fond of the clam that just shouts encouragements). So what a kid is going to get from this is that even when things are terrible, there is a way to fix them if people communicate and help one another. Big “if” there, I know. With the whole of the ocean at her disposal, Ms. Tsurumi could have chosen any underwater denizen as the titular baker. Her choice of crab has some notable advantages. Importantly, two claws (for easy gripping and baking), and six legs (for maneuverability). But even more important? No mouth. Why this choice? Most of the creatures in this book, after all, are talkative types. It’s not as if crab doesn’t speak. And it not as if crab doesn’t express emotions. But in keeping it from having a mouth, Tsurumi for the most part makes Crab into a means to an end. Its determination in the face of disaster matches its determination before the disaster ever happened. Because Crab Cake is a bit more message-driven than Accident it has a harder road to hoe. Even so, Tsurumi’s style is inherently endearing. You know what it is about her drawings that makes them work so well? The eyes. They’re rendered in a cartoon-style without being cartoonish, if that makes any sense. I think, again, of that image of the sea turtle staring at the garbage, aghast. It takes a real hand to know how to play that line between humor and horror. Certainly this won’t be the first book librarians think to reach for when parents walk in asking for books that help kids understand how to process trauma. It’s a bit subtler than other books that tackle that topic. Even so, I think it probably does a better job than a whole slew of the didactic, moralistic tripe out there. This is a book with a ridiculous premise that dares to deal with raw emotional weight, and somehow, bizarrely, the combination works. Cake may not save the world, but when times are hard, it’s amazing how it helps make everything just the tiniest bit better. Brilliant and uplifting!! A true true gem. A story that explores sea life, has a charming crab who makes cakes at the center, involves a surprising and ominous visual middle, and bestows a message of sustaining our oceans by way of crabs who make cakes being key. I love Andrea Tsurumi. Accident was one of my favorites of 2017 (a strong year for picture books mind you), and I think this will be one of my 2019 favorites (I know it's early to say that), but her art really works for me. This one picked up layers along the way and baked into something super sweet! Love the message of community coming together, cuter than I was expecting and I appreciated the non-fiction animal facts woven in, too! This is one takes the cake. (Okay, I’ll stop). What a beautiful lesson: use your gifts and use them fearlessly, and you'll inspire others to do the same. Under the sea, everything is nice and peaceful. Fish swim, dolphins play, and crab….bakes cakes? Read this incredibly fun and hilarious picture book about sharing, caring, and respect. An unexpected story of community and environmental awareness. It didn't grab me initially, but around midway the story took a turn that had me rooting for our ocean friends. The illustrations are fun, and the tale lends an opportunity to talk to young readers about cleaning up our oceans and working together to bring change. My son said it's good illustrations and people are messy. A silly but moving story about coming together as a community, taking care of our environment, and... a crab who likes to bake cakes. The illustrations here are really fun - expressive, energetic, and full of engaging detail. But something about the text/story doesn't quite work for me. Much of the description is or at least seems specific and scientifically accurate ("the venomous lionfish," the parrotfish who eats coral and poops sand, etc. ), so it feels kind of jarring for crab to be baking these whimsical cakes. I like the message that a small act of bravery can bring people to together to tackle big problems, and it's a p The illustrations here are really fun - expressive, energetic, and full of engaging detail. But something about the text/story doesn't quite work for me. Much of the description is or at least seems specific and scientifically accurate ("the venomous lionfish," the parrotfish who eats coral and poops sand, etc. ), so it feels kind of jarring for crab to be baking these whimsical cakes. I like the message that a small act of bravery can bring people to together to tackle big problems, and it's a pretty understandable environmental message even for a very little kid, but it just doesn't quite work for me. Give it a sec... because it's better than it seems. Andrea Tsurumi became an immediate family favorite in my household with Accident! and continues to impress with Crab Cake. She has one of the most unique and talented artistic voices in the picture book world today and I plan to be watching her career very closely indeed! All the creatures of the sea are busy doing their thing while crab bakes delicious pastries. Life continues as “normal” until a large pile of garbage is dumped into the ocean and over a slice of cake, they problem solve what to do. I thought the lesson of this book was that food brings communities together and my daughter thought the lesson of this book was not to pollute. Both morals are there and it says something about a book when it can cover two very different topics - conveying the quirky nature of this book. I enjoyed this book's little theme about how performing small acts of creativity and domestic nurturance can be a form of community organizing and resistance building. I also really enjoyed the little funny drawings of small oceanic cupcakes with coral and seashells on them. We are keenly aware of the necessity of conservation and respect for the environment. Houghton Mifflin Harcourt provided a review copy in exchange for an honest review. Crab Cake is partly realistic and partly anthropomorphic. With the exception of the titular crab, each sea creature behaves naturally. Crab, however, bakes cakes. When a boatload of humans dumps a boatload of trash overboard, all creatures in the sea are terrified. Crab, again is the exception. He simply bakes a cake, which brings the other sea creatures together, sparking a discussion of how to address the pollution problem. Working all together, they haul the junk back to land, pile it on a dock, and attach a sign saying, "Come get your junk!" Once again, the sea creatures return to their natural lives. With the exception of Crab, who still bakes cakes. I particularly like how the animals behave in this book. Over the years, I've moved us away from the animals-as-people books (excepting Richard Scarry, cuz I just love him! ), both from taste and research. Crab Cake, however, is one book whose anthropomorphic animals underscore its message. At first, the fish are swimming and doing fishy-things. When the humans dump their trash, disrupting the habitat, however, the natural behaviors are also disrupted. They start talking to each other, working to solve a problem logically, and pairing up with their natural predators. Once the ocean is clean, they return to their realistic selves. These changes drive home the message of just how unnatural and disruptive polluting the ocean is. Furthermore, the creatures' solution is so unrealistic that it cannot but spark conversation about valid options for protecting our oceans. And we see collaboration to solve a problem, always a plus! All in all, Crab Cake is a fun and effective way to encourage conservation. And if you like oceans, according to T, this book is for you. Son: I like this one and this one. I like how they both look. This one looks hungry and this one looks afraid. Let's read! Mom: How do they [the sea creatures] look to you? Mom: What do you think they're afraid of? Why? Son: The splash. Because it was loud. Mom: What would you do if you heard a huge noise in the night? Son: Well I would dress up like a ninja and I would pretend I wasn't afraid. Let's keep reading. Mom: How did they all feel? What are they getting ready to do? Mom: What would you do if a bunch of trash were dumped in your home. Son: Well on each of the trash I would write, "Please don't do this." And I would put it in a box and tape the box shut and send it to IKEA. Son: Because it's a far away place. Mom: What do you think of their plan? Why? Son: I like their plan. Because they save the ocean. Mom: What do you think would have happened if all that junk had stayed in the ocean? Could the fishies still live? Mom: What do you think we should learn from this book? Son: Don't throw trash into the ocean. Mom: What was your favorite part? Son, flipping to his fav. page: My favorite part was this page. This was my favorite part because they are all in a group. And octopus had an idea. Mom: How did it make you feel when all the trash got dumped in the ocean? Mom: When is it a good time to read this book? Son: When I'm interested in oceans. Mom: Who is this a good book for? Crab loves to bake cakes. He makes them every day as all of the fish and ocean creatures do what they usually do too. Pufferfish puffs, Parrotfish eats coral, Dolphin blows bubbles. But when one night a disaster happens and a load of trash is dumped on their part of the ocean bed, no one knows what to do. Everyone else freezes, just staring at the mess. Crab though doesn’t freeze and makes a big cake for everyone to share. As the animals come together, they form a plan. It’s all thanks to one cr Crab loves to bake cakes. He makes them every day as all of the fish and ocean creatures do what they usually do too. Pufferfish puffs, Parrotfish eats coral, Dolphin blows bubbles. But when one night a disaster happens and a load of trash is dumped on their part of the ocean bed, no one knows what to do. Everyone else freezes, just staring at the mess. Crab though doesn’t freeze and makes a big cake for everyone to share. As the animals come together, they form a plan. It’s all thanks to one crab who just kept on doing what he does best. Tsurumi’s picture book is filled with lots of small touches that bring this underwater world fully to life. The book reads aloud beautifully with quiet moments at first, the loveliness of crab making cakes for everyone, and then the disaster and its aftermath. It is a picture book that celebrates the creation of a community and the power of food to bring everyone together. It is also a book that looks at our oceans, caring for them and a love of the creatures who live there. The illustrations have a great cartoon look and feel to them that works well, creating moments of humor and drama very effectively. Six months ago, a movement came to international attention. In August 2018, Greta Thunberg, a sixteen-year-old Swedish student turned political activist, began to strike to bring attention to climate change. Throughout the world student-driven events in the form of strikes are growing. A website, FridaysForFuture, is a central location for information. On March 15, 2019 a global day of action is set in place. For those who educate and encourage children, telling them they can save the world, hop Six months ago, a movement came to international attention. In August 2018, Greta Thunberg, a sixteen-year-old Swedish student turned political activist, began to strike to bring attention to climate change. Throughout the world student-driven events in the form of strikes are growing. A website, FridaysForFuture, is a central location for information. On March 15, 2019 a global day of action is set in place. For those who educate and encourage children, telling them they can save the world, hope grows. What these children and young adults do not know is they might have unexpected allies. . . under the ocean waves. 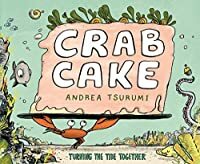 Crab Cake: Turning The Tide Together (Houghton Mifflin Harcourt, February 5, 2019) written and illustrated by Andrea Tsurumi presents a marvelous tale of typical and not-so-typical inhabitants of the ocean realm. A single defining moment causes the formation of a new normal. I love that Crab baking a cake gathers and centers the community in a productive way so that they can start talking about what to do to fix the problem. Also, all the other sea creatures going about what we normally think of them as doing and then crab baking (mixing? where is the baking? shh, don't ask questions) cakes is incredibly cute. It would be interesting to talk with kids about the underwater creatures fixing the problem in their community when that problem wasn't something they caused. 4.5 stars -- For a book about a crab who loves to bake confections, this is a surprisingly moving book. Humor and a love of nature combine to tell the story of a busy coral reef, an especially unique crab resident, and what happens when a garbage barge spills its contents onto the undersea paradise. Great story that will get kids thinking about ocean life and the ramifications of litter and pollution. Various sea animals are portrayed "doing what they do," all of which are realistic except for the crab, who bakes cakes. When a barge dumps a bunch of garbage, the animals are scared and silent until crab shows up with a cake, bringing the sea community together. The animals come up with a plan, working together to get rid of the humans' trash. What elements are realistic? What do you think are unrealistic? Why? Also good for Earth Day displays. This book is so cute! It's a great way to show kids not only the environmental impact we have on earth but how to stay positive in bad times and team work. The environmental impact portion of the story is great for all ages and allows adults to go into however much detail they want to with their kids. This review has been hidden because it contains spoilers. To view it, click here. The fish in the sea are doing all their normal fishy things except crab who likes to bake cakes. Then one day it grows dark from all the trash being dumped into the ocean. The sea creatures become sad and sick but with the help of crab's cakes they turn things around. A gentle message about keeping our oceans and water sources free of trash. This cool picture book not only introduces children to ocean animals, it tackles pollution, by showing kids how it affects ocean life, even sweet little Crab, who only wants to bake cakes. This will be a great book to read to kids anytime of the year, but particularly in the Summer, when they hit the beach. You'd think crab could make better use of its time. All the other ocean creatures do their ocean creature stuff, but crab...bakes cakes??? When disaster strikes, crab's cake brings the creatures together and they collaborate to take control of the situation (and stick it to the humans, I might add, who deserve the sticking!!). This one did make me laugh, and the highlight of the book is the "come get your junk" spread. I didn't quite understand why crab was making cakes, especially when crab cakes are made out of crab (I know, I know). A good attempt, but I wanted more. I think kiddos will like this one. I absolutely LOVED, LOVED, LOVED this story! One little crab bring everyone together and they all work together to clean up their ocean. I love the note they left for the humans! Perfect for every child AND every adult! I must purchase this book. I must. The creatures who are living under the sea go about doing what they are supposed to be doing. Including crab. Who bakes cakes. But don't be fooled...it's not all silliness. The creatures come together to right a wrong. I giggled the entire way through it.